Meathead Racing kicked off the 2012 SCCA Club Racing season on Friday March 9th with a practice day at Virginia International Raceway (VIR) in Alton, VA. Both Ted and Larry Cahall took advantage of the practice day with Ted testing his 1999 #77 Sheetz Spec Miata (SM) as well as his 2006 MX-5 Cup Car. Larry spent the day testing his 1992 #55 Spec Miata for the entire day. Bob Cahall arrived late Friday night and was ready for the SARRC races the next morning. Ted races in three of the SARRC races: SM, SM5, and STL. Larry raced in SM and SM5 while Bob raced in SM and STL (with his SM car). Ted set an official personal best in his SM with a 2:22.5 which beat his old record by 1.1 seconds. 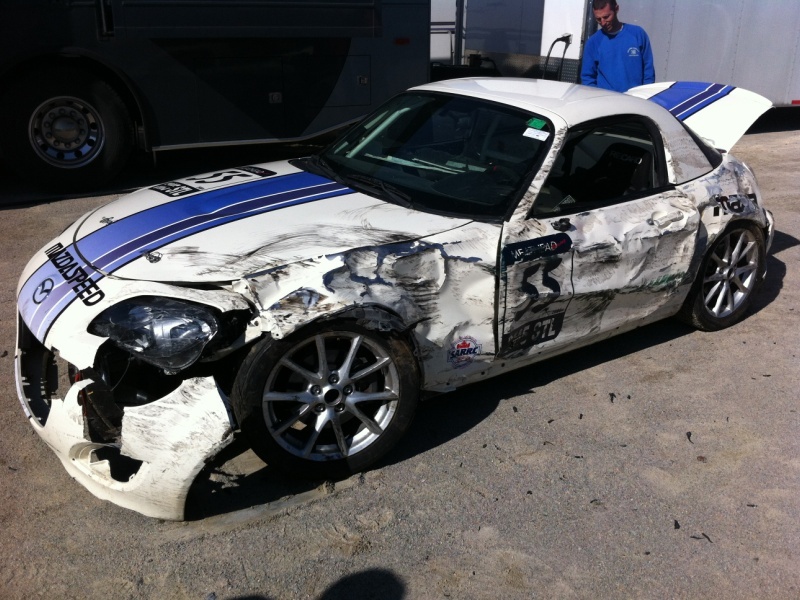 He later recorded a personal best in an MX-5 of 2:17.1. Ted finished 14/42 cars in the SARRC SM race. He also finished 2nd in class in the SM5 and STL races. Bob and Larry both enjoyed themselves. On Sunday morning, Ted decided to pass on the enduro race due to some elbow and shoulder pains and the fact that his hands were experiencing some carpal tunnel issus (an hour and a half long race generally does not help those issues). Bob finished his first ever enduro in classic style. 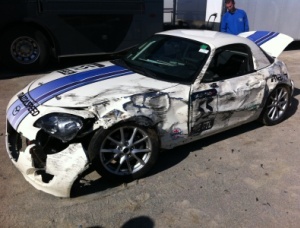 Unfortunately, Larry hit the tire wall outside the upper esses and nearly totaled his MX-5. Pictures included. As always, a huge thank you goes out to Wendy, Karen, Mike Collins and Meathead Racing for their pit crew services!